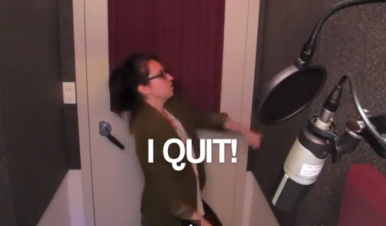 Snubbed boss of Next Media Animation counters with “We’re hiring” video. Shifrin, 25, a graduate of the University of Missouri School of Journalism, moved from New York City to Taiwan for what she had hoped would be a job that “was in theory a perfect marriage of her two passions – journalism and comedy.” She worked the night shift – 8pm until 5am – and because of language differences was unable to communicate with her Taiwanese colleagues. Shifrin – who criticized her boss’ emphasis on page views – has garnered nearly 7 million views for her “I Quit” video. The most popular video on NMA’s official YouTube account, by comparison, has 5.6 million views. Still, Shifrin may have inadvertently given NMA several million clicks that it wouldn’t have otherwise received without her free, albeit negative, PR video. Looking to capitalize on the original video’s interest, a team of NMA staff (including the boss that Shifrin singled out in her video), made a nearly frame-for-frame rebuttal to announce, “We’re HIRING.” Posted yesterday, it has received over 100,000 hits thus far. The company is known for its comedic mash-up videos of news and shoddy CG animation. Mark Simon, NMA’s commercial director and de facto company spokesperson, wrote a letter to Gawker, the media outlet that Shifrin shared her video with (thus propelling it to fame), expressing his confusion over the whole fiasco. “There is an image now of a sweat shop, we are not. Marina made $42,000 per year. She had a 40 hour work week, 5 days a week. There is no expectation of OT on our behalf, you finish your shift and leave,” Simon wrote. Shifrin’s video was shot at 4:30 am, perhaps leading some viewers to believe that she was pulling a 20-hour shift. Her annual salary is nearly triple the average salary of a Taiwanese national with a Bachelor’s degree – Focus Taiwan says that they can expect to make $15,000 a year. “We ask journalists to work one month per year on the midnight shift as we just need to cover the shift. We pay a differential of 30% for these hours, which I know are hard hours to work,” Simon added. The Internet’s always-opinionated commentariat was divided over Shifrin’s method of leaving the company. Did the stress of working in Asia – a region notorious for long hours and a very different work culture from the West – take its toll? Is she simply young and entitled, lacking common decency and an understanding of how the world of online journalism works? “Marina's a viral marketer, and her video went viral. Big Time. In the process she made some people smile, promoted her name, and now has some new job opportunities. Maybe she'll hit it big, maybe she won't,” said one Huffington Post commenter. Pyongyang is worried by a new trend: the rise of South Korean conservatives on YouTube.